Home theater soundproofing will keep sounds in AND keep sounds out. Keeping sounds in is great for not waking up the kids or significant other for instance. Also great for not disturbing the neighbors. Keeping sounds out is good for allowing you to listen at a comfortable volume without having to worry about distracting noises from outside your theater. For instance, traffic sounds from outdoors or kids banging around upstairs. Acoustics deal with the quality of the sound within the room. Acoustic treatments deal with sound reflections such as echoes and reverberations. A lot of time and effort is put into the audio engineering of movies and the unnatural reflections within your home theater color the sound in a very unpleasing way. Decoupling involves physically isolating elements from other elements so they can not physically transfer sound to another object. One of the typical ways this is done is by staggering studs in a wall so that drywall on one side of the wall is nailed into one set of studs while drywall on the other is nailed into the alternating studs. This significantly cuts down on sound transfer since the sound waves collected by one side of the wall can be physically transmitted directly through to the other side. Light things are easy to move and heavy things are difficult to move. Adding mass to a wall or door will significantly reduce its ability to transfer sound. There is a lot of confusion around acoustical foam blocks and panels often seen in sound booths and similar places. Foam is very light and has very little mass so it doesn’t do much to soundproof an environment. I does affect reflections to prevent echoes and reverberations. This is why it is used in recording environments. Dampening is converting sound waves into heat. This is typically done with viscoelastic compounds. A very common way this is done in homes is with a product called Green Glue Noiseproofing Compound. It is applied between 2 layers of drywall. The compound will “jiggle” with the sound waves and dissipate the energy as a minute amount of heat instead of transmitting the sound waves through to the other sheet of drywall. Absorption isn’t very effective at soundproofing but is at helping with acoustics. This is where acoustics vs soundproofing comes in. Acoustical panels or foam are great examples of sound absorption. Sound waves are absorbed by the panels or foam and not reflected back into the environment. Loud sound in general can be difficult to soundproof agains but the deep bass from subwoofers is incredibly difficult to stop from conducting through walls and ceilings. To adequately soundproof for the full range of sound in a home theater you will need to decouple the wall and ceiling surfaces as much as possible. To maximize our soundproofing we need to start from within the walls and ceiling and work our way out. If there is any insulation we’ll want to remove that as well. Make note of any penetrations such as light switches or power outlets on both sides of the wall. 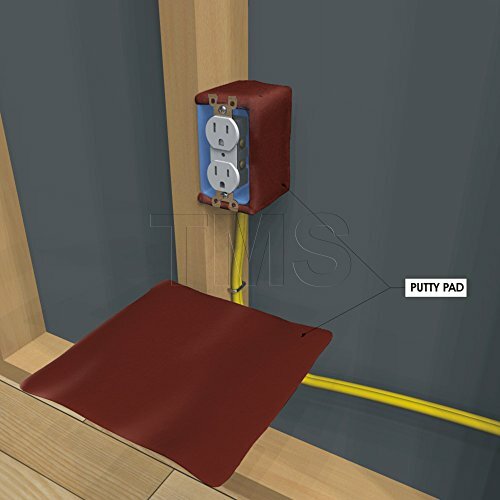 You will need to apply acoustical putty pads to the back sides of all of these electrical boxes. You’ll also need to address any other holes from plumbing or wiring with a good noiseproofing sealant like Green Glue Noiseproofing Sealant. 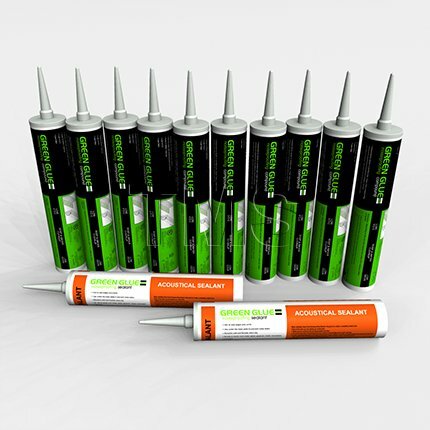 This is not to be confused with Green Glue Noiseproofing Compound which is used as dampening between multiple layers of drywall. A high quality soundproof insulation is the first line of defense. Roxul Safe’n’Sound soundproofing insulation is the preferred choice in this situation. Safe’n’Sound is only meant for interior walls however. If you’re dealing with an exterior wall you’ll want to go with an exterior wall insulation from Roxul such as ComfortBat. Roxul is a mineral wool product and is very dense, very fire resistant, and very good and reducing noise penetration. It is literally made from rock. The ideal install is to use 2 layers with an air gap in-between. Over top of the insulation you’ll install a layer of mass loaded vinyl. This is a very dense material that will cover the entire wall and ceiling between the insulation/studs and the isolation clips/hat channel/drywall. It adds a critical extra layer of mass to significantly deaden the wall or ceiling. It is rolled out across the wall and stapled to the studs. Seams are overlapped and taped. 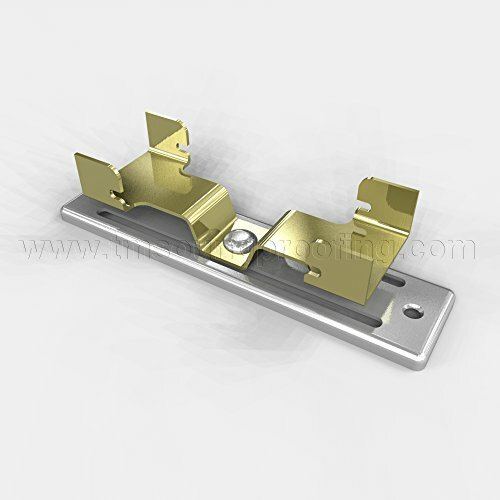 To ensure that sound doesn’t conduct through the drywall to the wall studs or rafters sound isolation clips are used to mount a hat channel. This decouples the drywall from the studs. The sound isolation clips are mounted to the studs and the hat channel is attached to the clips. The hat channel is decoupled from the studs via the clips. A layer of drywall is screwed into the previously installed hat channel. Be sure not to screw past the hat channel and into the studs. This will defeat the purpose of the sound isolation clips and hat channel. Once a layer of drywall has been installed, seal all joints with noiseproofing sealant. Again note this is sealant and not compound. Next we will apply a second layer of drywall but to do so we will apply Green Glue Noiseproofing Compound to the drywall sheets. Once the Green Glue Noiseproofing Compound is applied the drywall is screwed into the previous layer of drywall. Once Step 5 is complete the walls and ceiling can be taped, mudded, and sanded as normal. It’s possible to go even further than this but it starts to become fairly expensive and impractical. Going further involves building a wall in front of the existing walls with a gap of 2 inches in-between. You would apply everything that has been described above to both sets of walls. As for the ceiling, it’s difficult to drop the ceiling much without compromising the height so this can be especially difficult to do in a retrofit scenario. This extra process is essentially a massive decoupling. This will more than double your expenses and the steps above outline a very effective solution making this only practical for those in unique situations. You can apply this technique to only walls that present a significant problem as opposed to the entire room to save money, time, and effort. If you’re home theater is on the second floor of your house and you need to soundproof it then you would apply the techniques described above to the ceiling of the room or rooms below your home theater. You will also want to adhere 2 layers of drywall with noiseproofing compound to the sub flooring. Doors and windows present their own unique challenges. If you have the means, purchasing good quality soundproof windows and doors that employ specific methods to reduce sound penetration are the best route. If that isn’t realistic in your particular circumstance you’ll need to address the chinks in the armor of each as best as possible. The first issue to address are any air gaps. Be sure to seal any windows as tightly as possible. You may just need to replace existing seals or you may need to add seals. The design and quality of the window will determine what you’ll need to do. 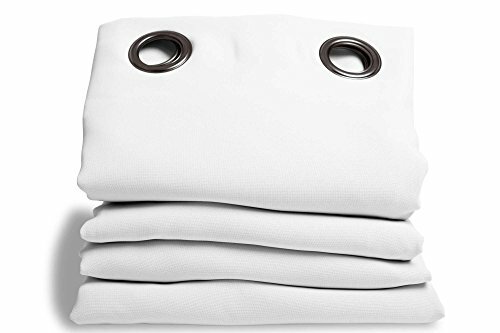 Purchasing some good quality soundproof curtains is highly recommended. You can close these when viewing and it will also help with acoustics on the highly reflective glass. Adding a window insert and/or storm window adds an extra layer and an air gap that will significantly improve soundproofing. The denser a door the better starting point you have. If your door is a hollow core door you should seriously consider replacing it. A hollow core door is almost like not having a door at all. Like with windows, you will also want to seal any air gaps. This may mean installing a threshold with a seal. You will also want to make sure there is a seal around the tops and sides of the door as well. Once your home theater has been thoroughly soundproofed you’ll want to address acoustics. This is all about the reflections of sound off the walls and hard surfaces in your home theater. If you’re noticing some bass boomy-ness in some locations or overly bright sound in others you definitely are suffering from acoustical issues. The smaller the room the more likely you are to have these problems. You can likely tame these issues to a large degree by lining the walls with soundproof curtains or placing some acoustic panels along the walls. If the issues are mostly with bass then adding an additional subwoofer can help smooth out the boomy and flat spots. If you’re still experiencing issues you’ll need some hardware to analyze your setup and determine the optimal locations for applying sound absorption and diffusion materials. You can hire a team of professionals to do this for you. This is probably the most efficient route to go if the problems are severe versus trial and error. Soundproofing a home theater is a fairly involved endeavor. You can do it yourself with some time and patience and save yourself a considerable amount. When you know what to do it’s not a terribly difficult job but it is a big one. 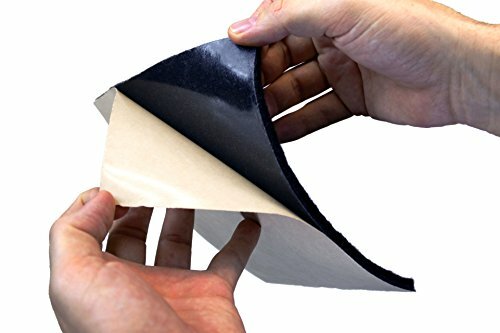 Also, you may be in a situation where you don’t need to go all in on soundproofing and may just want to apply some of these techniques. Unfortunately the most effective solutions are going to result in the most expense. Decoupling is the most effective method of soundproofing.